Hugo David Pohl (1878-1960), Untitled [panoramic landscape], 1909. Gouache on board. Previously owned by Harold Fowler McCormick, Class of 1895, and given by Alexander Stillman. GA 2012- in process. The American inventor Cyrus McCormick (1809-1884) patented a mechanical reaping machine and in 1847, moved his business to Chicago to form the McCormick Harvesting Machine Company. When he died, his son Cyrus McCormick II (1859-1936, Class of 1879 H1887) took over and began hiring professional artists to decorate and promote the business. Albert Herter (1871-1950) and his assistant Bror Nordfeldt (1878-1955) were two of the artists commissioned to paint company murals. 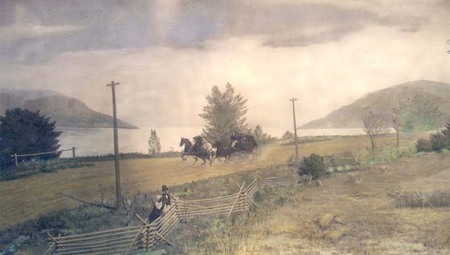 When McCormick merged the firm with J.P. Morgan’s Deering Harvester Company in 1902, forming the International Harvester Company (IHC), painters and printmakers were again used to promote the new company. Hugo David Pohl (1878-1960) was among the men hired to paint panoramic murals at IHC depicting harvests in various countries. It took Pohl eighteen months to finish his commission and when it was done, he left Chicago for San Antonio, Texas. Pohl opened a studio specializing in mural decoration and eventually became president and director of the San Antonio Academy of Art. 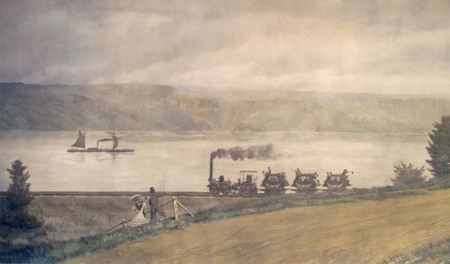 The IHC passed to Harold Fowler McCormick (1872-1941, Class of 1895) and in 1966, the family’s collection of art and books was given to Princeton University Library, including one of Pohl’s panoramic paintings. 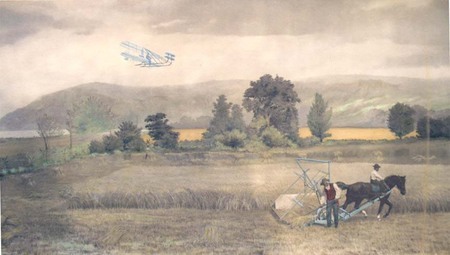 Presumably a model for an IHC mural, the painting highlights a series of inventions including a steam engine, a horse-drawn McCormick reaper, and an early airplane (probably to please Harold, who was an aeronautics enthusiast).